Gotta love cherry season! There’s nothing like munching on a big bowl of those fresh beauties! I had a cherry-based dessert at Gotham Bar & Grill recently. I remember thinking that it would have been better with sour cherries because sweet cherries lack the deep cherry flavor and tang that I love. That got me thinking about adding the tang back into sweet cherries. Pickling them seemed a natural progression. I’ve never pickled sweet fruits before, but these pickled cherries are brilliant on a cheese platter or with some cured meats or pate. My tummy is a-rumbling. I decided on cardamom as the predominant spice for this recipe with some black pepper to add a li’l bite, as well other sweet spice accents and vanilla for depth. What’s cool about this recipe is you don’t have to pit the cherries—YES = less work! I’m all about recipes that are easy!! Can you hear me singing, “Life is like a bowl of cherries”? There’s nothing I love more than a perfectly ripe cherry when it’s sweet and firm so it bursts in my mouth when I bite into it. I could eat them every day of my life. But, alas, local cherry season is over before you know it. One way to save a bit of it for the darks days of winter is to pickle them. Make brine by bringing ingredients to a gentle boil and stirring until the sugar dissolves. Simmer for 20 minutes. Sterilize jars and cool slightly. Strain brine, reserving all the spices except the cloves. Divide remaining spices in each jar. Break up the cinnamon stick. Add cherries to jars. Put hot brine over cherries. If you don’t have enough brine top of jars with a little more vinegar. Place flat lids on each jar. Screw on bands to seal but don’t over tighten them. Cool jars on rack. Store in cool place for at least 3 weeks before eating. 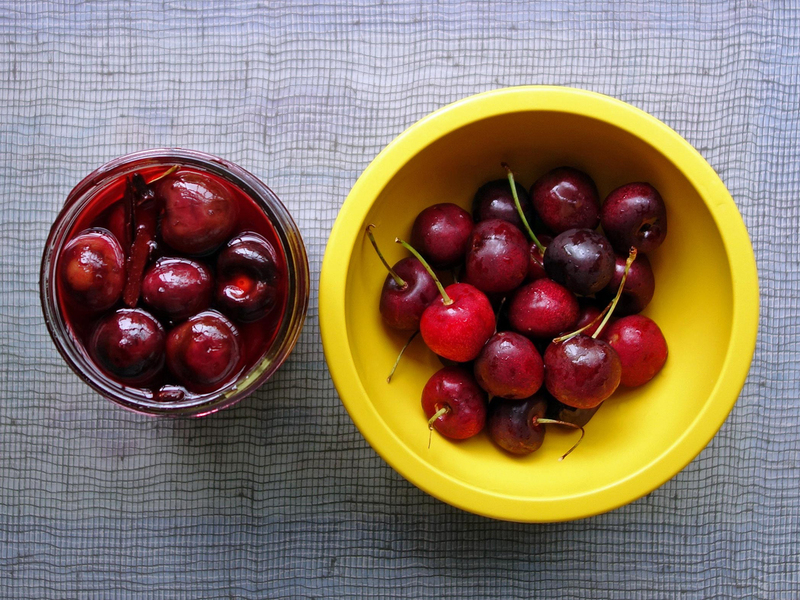 The proportion of cherries to brine is 10 ounces of cherries in pint sized jar with 6 ounces of brine.